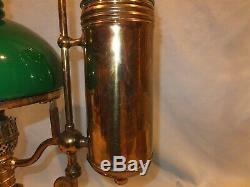 This is a nice Old Antique 1870 - 1880 original midsize Brass Manhattan student oil lamp. 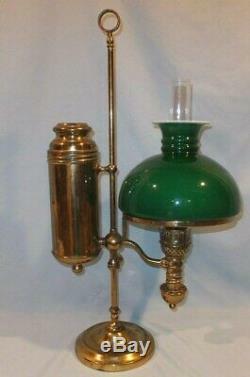 This lamp is ready to use just add lamp oil and it would be ready to light. Wick raises and lowers easily. 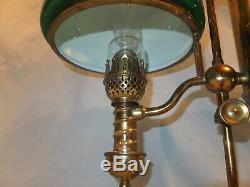 The green cased Shade has the very scarce double ring at the top. You can find white milk glass shades with double ring at top. Double ring Green cased Glass shades are much harder to find. As you can see by picture the green oil tank is your regular size Manhattan student oil lamp font. 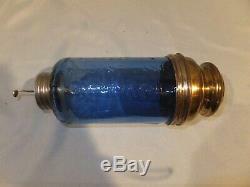 The Blue font is a Midsize oil lamp. Lamp is made like a 10 Manhattan student lamp with the two connectors coming off of the font holder to connect to the pole. The more common 7 Manhattan student lamps do not have the top connector to the pole. 12 1/2 wide 22 3/4 tall. Shade is 8" wide 6" tall and has a 7 fitter. Lamp looks to have original finish but has some Lacquer runs on the blue font holder. The only dents I see are on the top of the weighted Base, no other dings or dents. 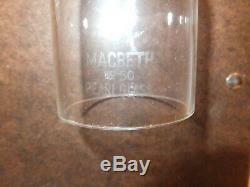 No chips or cracks in the Green cased shade or the Macbeth chimney. I have been asked in the past if these lamps had flame spreaders. 7" Manhattan student lamps do not have flame spreaders only the 10" Manhattan student lamps had Flame Spreaders. 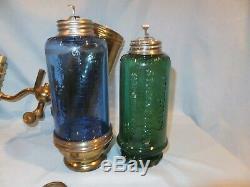 I will be listing many oil lamps this late winter and spring. 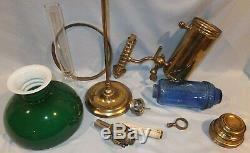 I still have a couple hundred lamps and parts to list , I still have some very nice miniature oil lamps to be listed. I have a fancy Brass Hitchcock oil lamp. 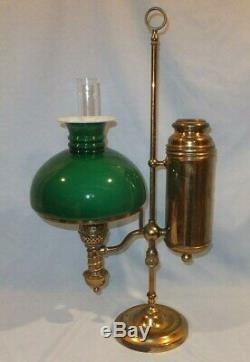 I have a all original miller Figural cigar oil lamp lighter. 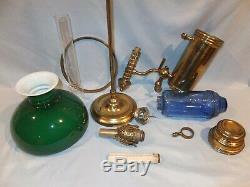 A couple Gone with the wind oil lamps and Ball shades. Be sure to keep checking Back. I start all my auctions on Thursday night 5 P.
The auctions lasts for 10 days ending on Sunday night. 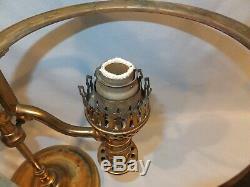 The item "Very Scarce Complete 7 Brass Manhattan Student Oil lamp" is in sale since Thursday, February 14, 2019. This item is in the category "Collectibles\Lamps, Lighting\Lamps\ Non-Electric\Kerosene". The seller is "mountainoil" and is located in Greenwood, Missouri.